Interface, part modeling and 2D drawings are just a few of the things that designers rely on and work with every day. Now, with some brand new tools and some improvements to the tools you already have, theses are a few ways SOLIDWORKS 2019 helps you get your job done faster than ever before. Designing has never been faster or easier than it is in 2019. The new updates in SOLIDWORKS 2019 help you get your work done better and more efficiently than before. In this video, we introduce several of the new features in SOLIDWORKS like the faster installation manager, which provides two times the speed that of the older updates, and overhauled external references UI tool. Other new features include an upgrade to dynamic reference visualization, live measure tool, improved tab and slot and so much more! Performance, efficiency and ease of use are the things that we think of when we think of this update, and you will too! In addition to this overview, we also highlight some specific features from this episode in their own deep dive videos below. SOLIDWORKS 2019 pushes the bounds of ease of use and user experience with new features that will help you out with the things you do on an everyday basis. In this video, we will go into detail about 3 improved features, dynamic reference visualization, faster installation manager and enhanced welcome screen, that will increase your efficiency. Part modeling in 2019 just got a whole lot better. The improvements in the latest version of SOLIDWORKS help you get you work more efficiently and get your designs out the door quicker. In this video, we introduce new features like slice command, split command, interference detection for multi-body parts and a new partial chanfer tool. The brand new 3D textures tool is one of the biggest additions to SOLIDWORKS 2019. It transforms 2D pictures into 3D geometry. This tool can be used for additive manufacturing or enhancing visual appearances. 3D textures enables you to take your designs to the next level by accurately reflecting the finished products in a streamlined workflow without creating time consuming features. The topology study feature is greatly improved in SOLIDWORKS 2019. Now there are even more reasons for designers to rely on topology studies to guide them through the design process. Functionality has been expanded to include frequency constraints which enables you to create more robust designs. We also cover other new features like the stress and factor of safety constraints and the export smooth mesh option. With topology studies in SOLIDWORKS 2019 coupled with mainstream 3D printing techniques and latest advancements in manufacturing, you'll be set to create designs you never could have imagined. Weldments are a key feature of many designs. One of the most exciting, new features in SOLIDWORKS 2019 is the structure system tool, which provides a new way to create weldments. This tool uses much simpler and more familiar entities like surfaces, sketches and planes. The structure system tool creates an advanced weldment environment that lets you create end modified structural members of different profiles in a single feature with flexible quarter managment and trimming. One of the top enhancements in SOLIDWORKS 2019 is the tab and slot feature. This fucntionality is incredibly useful for fabricated metal designers. This feature has been greatly enhanced in 2019 based on customer feedback to better reflect real world applications. Changes to this feature include the no through cut option and the expanded corner options. Now, tab and slot is a must-use for anyone looking to create interlocking or self-ficturing geometries. The new features to drawings in SOLIDWORKS 2019 deliver powerful new enhancements that make documenting your designs even faster. In this video, we go into detail about new drawing tools like the new remove section view, reduced tool path, tag type options and exclude from automatic update option. Conveying the complexities of your design clearly and concisely have never been easier with SOLIDWORKS 2019. 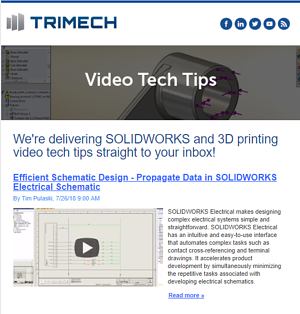 If you are looking for a way to keep you up-to-date on your SOLIDWORKS skills, then subscribe to our weekly Video Tech Tips! Each week we will send you a tech tip straight to your inbox! Each video is typically about three to five minutes long, but can save you countless hours of design time.